If you've been reading the blog for a long time (hi Matt! ), then you might find it sort of conspicuous that I haven't written anything on the horrific terrorist attacks in Paris on Friday. The simple truth is that I have tried on a couple occasions, but everything I've come up with just feels hollow in the face of the enormity of that evil. It also doesn't help that the story has still been unfolding and, while we seem to have a decent grasp on what happened now, it's hard to say what the repercussions of this attack may be. I might write up something eventually, but at the moment I can't say for certain. 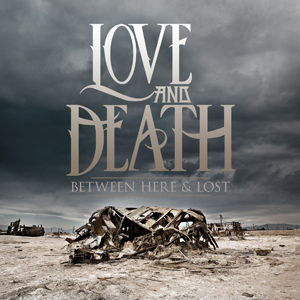 First up this week we have "Whip It" by Love and Death, from their album Between Here & Lost. This is actually a cover of a song by DEVO, which I hadn't actually listened to before picking this for the playlist. It's... wow, it's such an enormous difference that I'm having a hard time articulating it properly. The DEVO version is a really fast, silly, goofy-sounding 80s pop track, whereas Love and Death's version is a very heavy, crunchy, serious and slower-tempo track. It makes me wonder how the heck Love and Death got the inspiration to cover this song, because it's just so far removed from the original version. Secondly, we have the title-track "Nostradamus" by Judas Priest. Last week I was going on about how I was (finally) starting to get into Iron Maiden, but still wasn't a big Judas Priest fan. However, I am a big fan of this song, which just so happened to play on Metal Rock Radio when I was thinking about how underwhelming I found Judas Priest to be. This is just the sort of metal that I love: dark, epic and lengthy. 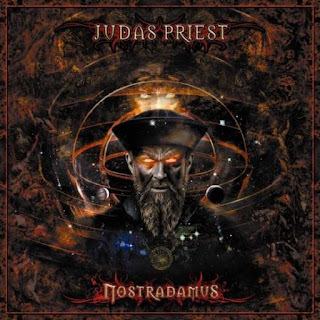 It sounds more like an Iron Maiden, Mastodon or old-school Metallica song rather than what I'm used to hearing from Judas Priest, but maybe I'm just not familiar enough with their discography yet.